Robey Martin sums it up well for eating suggestions this new year — read your local food writers along with 5 other great tips! E.A.T. is very happy to be included among such great company with Kendra Bailey Morris of fatbackandfoiegras.com and Matt Sadler kicking it on Tumblr! No matter where you are visiting, checking up on the local food writers really does shed light on what might be happening with eats in town. 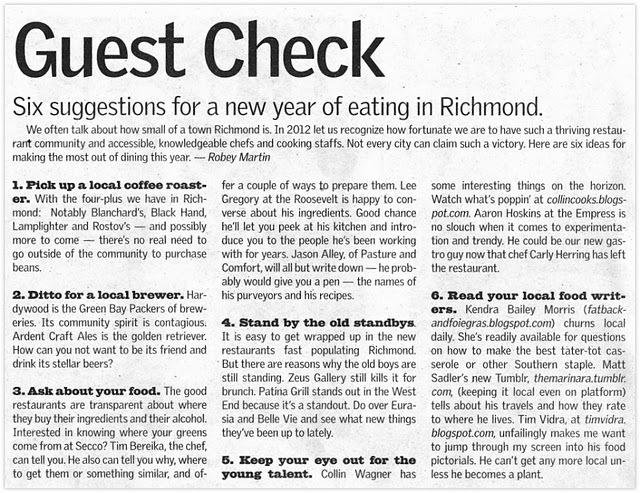 If you find yourself in Richmond, all 6 suggestions above are sure to make for an inviting and personalized visit. Thanks for the shout out, Tim!